Lägenhet i gamla stan, 2 'från Plaza del Ayuntamiento! Andra våningen i byggnaden utan hiss. 1 sovrum, 1 badrum, vardagsrum, öppet kök. Rum: 1 dubbelsäng. Med utvändigt fönster. Dessa betalningar kommer att regleras i slutet av kontraktet, med den verkliga konsumtionen som görs i hemmet. Tillbringade en härlig höstsemester i en fräsch lägenhet mitt i Palma, nära till allt. Allt fungerade hur bra som helst från första förfrågan om lägenheten till mötet med Victoria, som verkligen var tillmötesgående och trevlig. Lägenheten motsvarade våra förväntningar efter de bilder vi sett, rent och fint. Jag rekommenderar verkligen denna lägenhet. The apartment is spacious and well fitted. Modern bathroom and shower. Kitchen is good, although I didn’t use it. Bedroom is a little compact but has plenty of hanging space for clothes. But the location is in the centre of old town, everything is within walking distance. Palma is a beautiful city, I never tire of walking around it. The hosts are very good, always answer queries promptly and efficiently. Can’t fault it. Lovely apartment. I had the best time. We (husband, myself and 18-month old) had a fantastic stay at the apartment. Victoria y Mercè even went to the trouble of setting up the cot and getting a high-chair in, which was a lovely touch. The hosts made some very useful restaurant/beach/sight-seeing suggestions which were handy as this was our first trip to Mallorca. 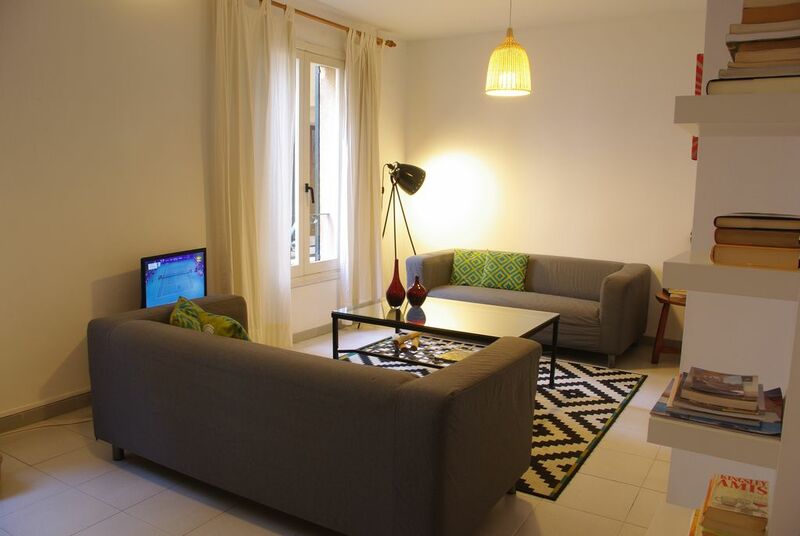 The apartment is very central - close to shops, sights and transport links. As the apartment is in a shopping area (rather than being surrounded by bars/restaurants) it was busy during the day and quiet at night. We really enjoyed our stay in this lovely apartment. The location is perfect in a good area of the old town. Victoria and Mercè were a pleasure to deal with in every aspect of booking and our arrival. They were also very helpful with advice to make our stay as enjoyable as possible. The apartment is very clean and is equipped with all you need for your stay. Being in the old town we were very pleasantly surprised at how peaceful it was of a night, the bed was also very comfortable so we had a really good nights sleep after each of our busy days! I would not hesitate to recommend a stay here and can’t wait for our next stay.